Parshevitsa mountain and ski resort near Vratsa, Bulgaria. Purshevitsa skiing, snowboard, snowboarding. Parshevitsa is a small ski resort, situated in Vratsa Balkan Mountain Range. It is in very close proximity to the quiet and beautiful city of Vratsa (only 25 km) and Vratsata Gorge, which is a starting point to the Parshevitsa Hut, as well as to Ledenika Cave and Skaklya Waterfall. Located 112 km away from the capital city, Vratsa is a very popular destination, offering good opportunities for ski tourism, mountaineering, para - gliding and eco tourism. Parshevitsa ski resort offers one well- maintained ski- track, perfect for beginners or intermediates in skiing and snowboarding. 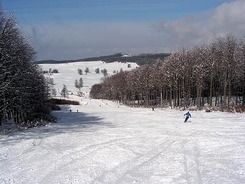 The ski slope is situated at 1300 m above sea level. The length of the trace is 1100 metres and the drag lift can take up to 300 persons per hour. The site is also perfect for camping during summer.